Adding to Dave and Max's shots of the coal storage moves, we go back a couple of weeks to the 193 pulling coal empties out of storage on the North Shore Scenic Railroad. 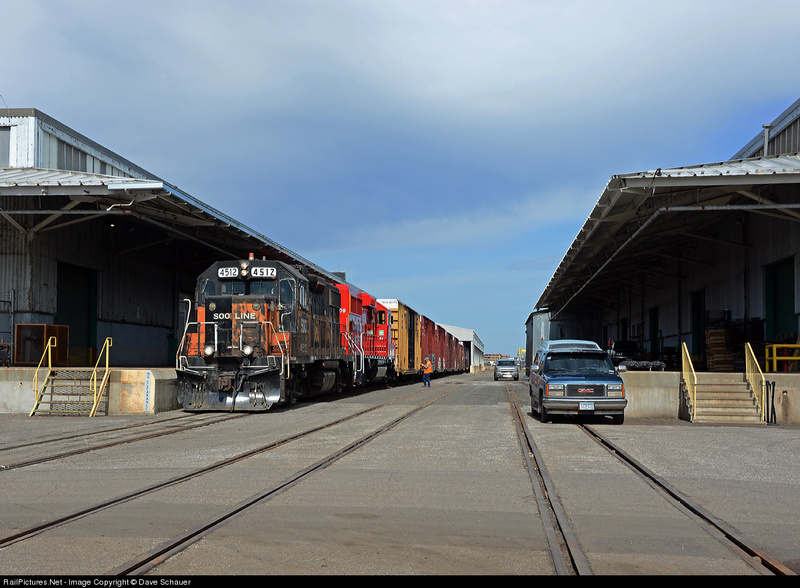 CP’s “Beauty and the Beast” pair were spotting boxcars at Lake Superior Warehousing yesterday as the sun poked through. I’ve always liked this area as it is one of the few left in Duluth with an industrial feel. 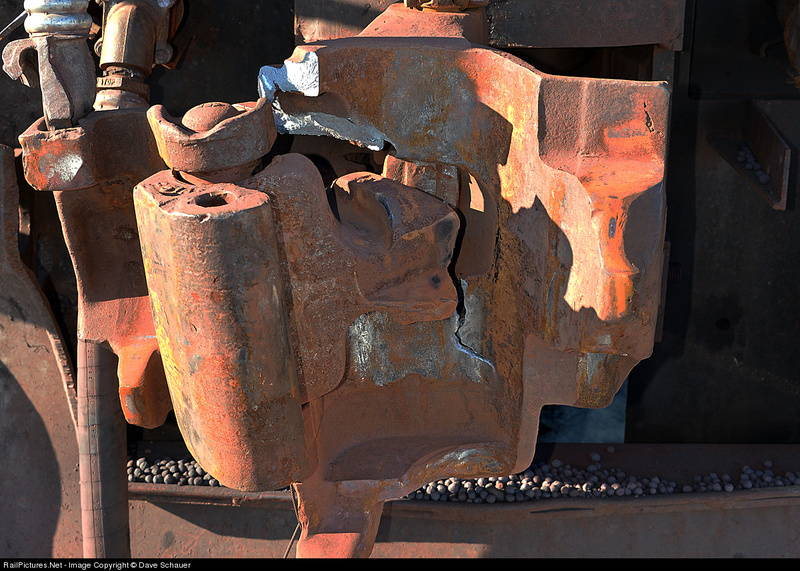 ....the coupler on your SD40-3 breaks. Not just the knuckle, the coupler itself. D’oh! 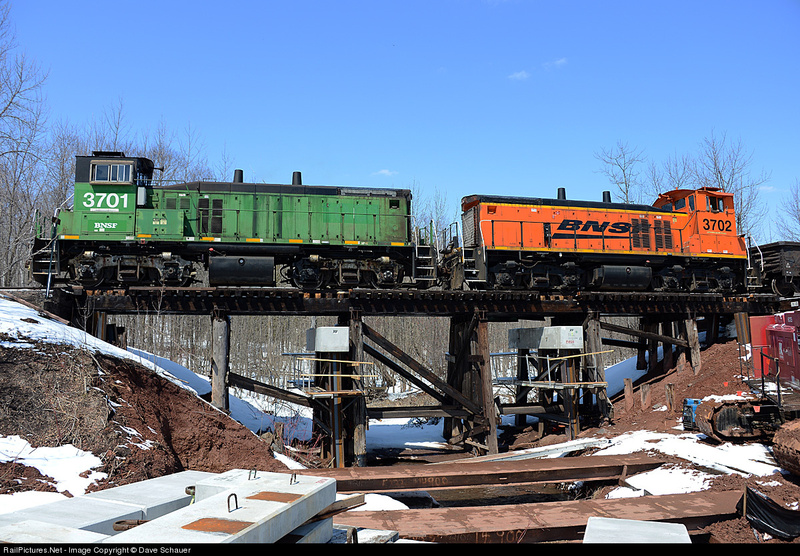 They set out the unit and went about their business of dumping the ore train and returning it to Proctor with two SD40-3s. I think they came back down later and dragged the unit back to Proctor. I like the taconite pellets stuck on the pilot. It sounds like BNSF will replace the old wood piling bridge just east of Tate & LyleL in Riverside starting tomorrow and working through Wednesday. Here is what it looked like last week. With the Brainerd Local making it last run to the Mill today I had toyed with chasing it but business commitments precluded me from doing so. However I did catch it and a couple of coal trains on Huson Bridge. Here the local scoots west behind a coal empty. I shot the empty first but it had a crusty Grinstein in the set so I’ll hold off posting that one. 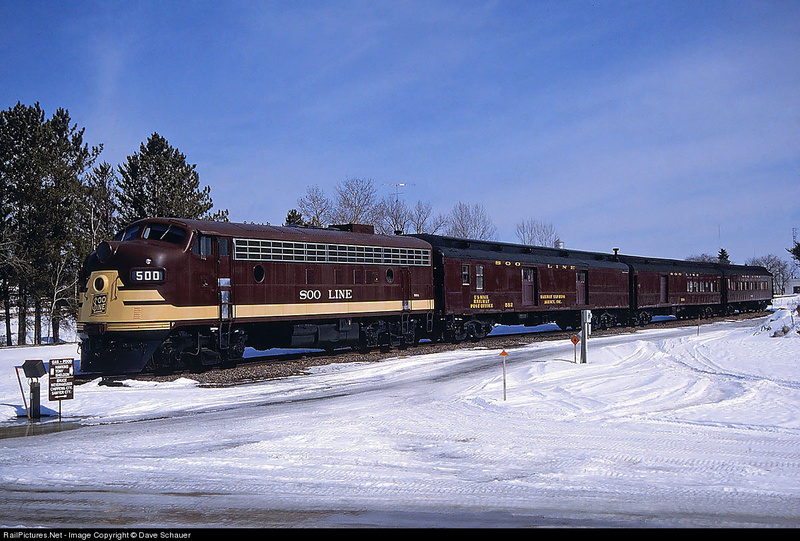 My first shot of one of these actually on a train as it passed by the iconic Soo Line sign on the depot along Winter Street. With Tower Avenue closed this street (Ogden Ave) is very busy but a nice SWL&P driver held back and allowed me to get the shot. Even though we still have snow on the ground it is getting to be the dreaded “high sun” time of the year where mid-day light is direct and harsh. 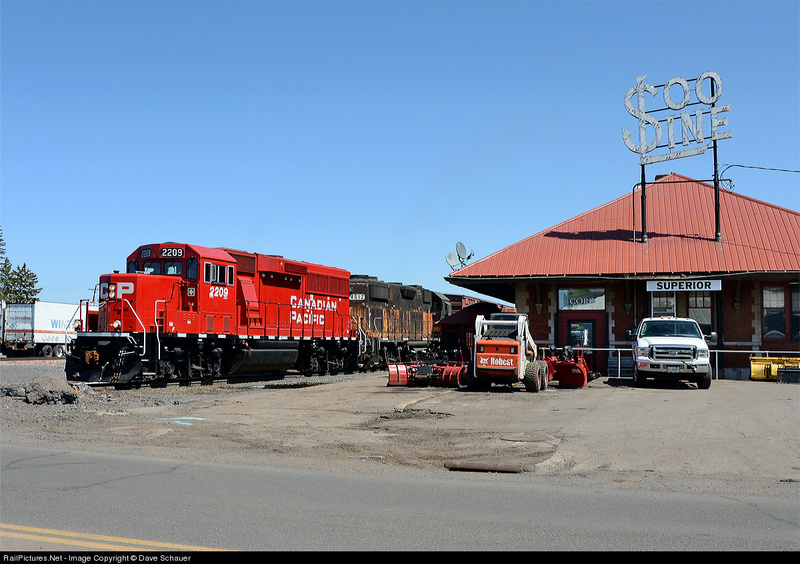 This one comes from the southern end of the TPR coverage area at Ladysmith and shows the Soo Line passenger train display in that small town that was once an important crossing on the Soo. The line to the left of the display was rebuilt this year to handle sand traffic but I haven’t been down there to catch that move (sounds like it runs at night). Not sure if the display looks this way today but the paint looked good in 1995. The FP7A is similar to the 2500A (WC) at the LSRM. 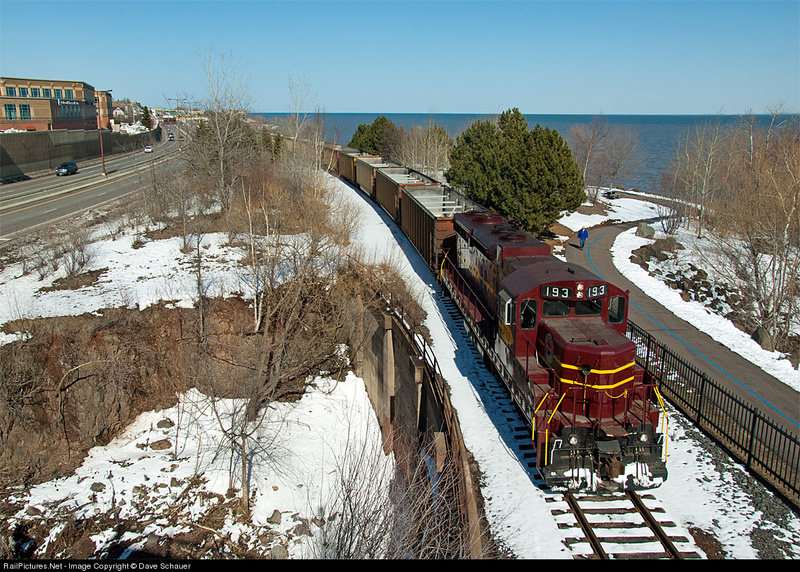 On Saturday when the 193 was handling coal empties along the Lakefront Line I wanted to shoot it crossing the large concrete bridge spanning Chester Creek on the far eastern side of Leif Erickson Park. The light hadn’t moved around totally but it turned out ok.
Flashback 30 some years and here is a grab bag shot I took at dusk of the same bridge but looking west. I remember taking this shot because I liked how the Aerial Bridge was up and despite color print film and very low light I was happy I did. I was digging through a few slides from a visit to the mine a few months before the operation closed I scanned these two. 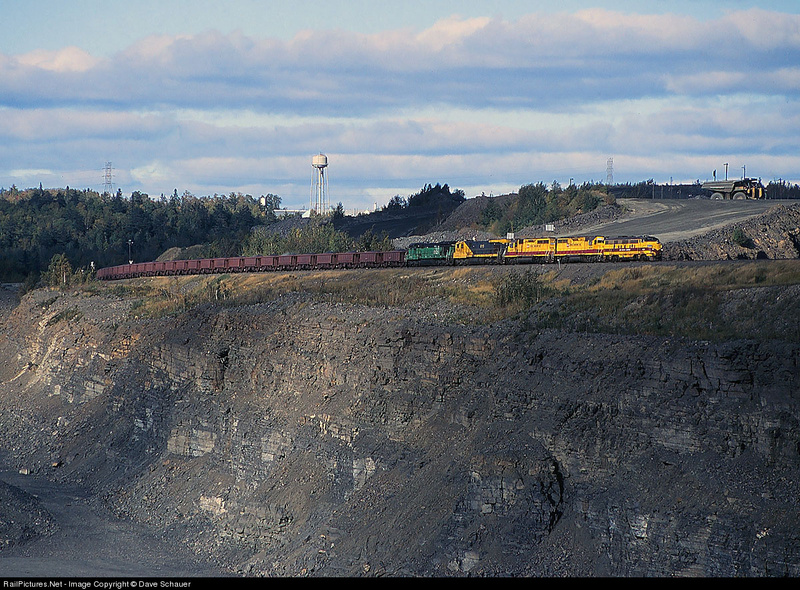 One of my favorite shots of an ore train was this one of a load departing the plant for Taconite Harbor and it shows the train passing a deep mine pit. The mine trucks on the right are as impressive. This is another favorite – it shows a mine run train behind a pair of RS-11s and what I like is the view of the pellet plant in the distance (you can see a pair of GP38s in the distance). 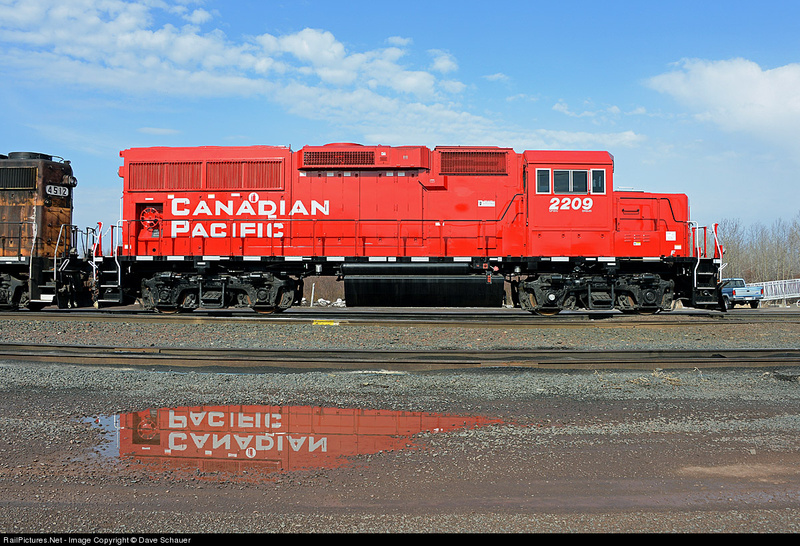 CP has assigned a new GP20C-ECO to the Twin Ports. It makes for an interesting pairing with 4512 still in Milwaukee colors. I haven’t been able to get it on a transfer but it made for a nice broadside this morning before the clouds moved in. When I first saw photos of these I thought they looked short but seeing it in person next to the 4512 they look as tall and as husky. Still nice and clean – a stark contrast to the faded paint on 4512.